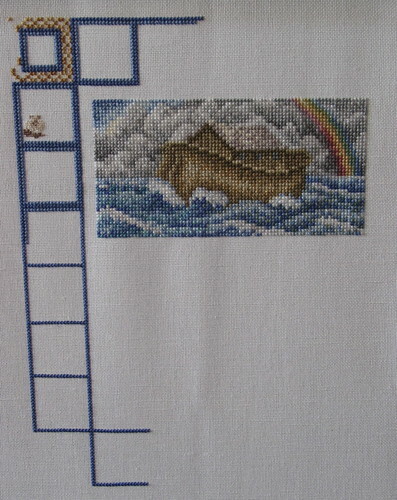 This is the progress to date on my Noah’s Ark cross stitch. It is coming along fine, but the over-one stitching is a daytime only event as the count of this fabric is a little bit too fine for my eyes to cope with at night. There is also one other problem with it. I am having a crisis of confidence. Do I really want to finish it? The over-one stitching is hard work and I’m now not 100% confident that the animals will look good when they are finished, even backstitched and all. I have even contemplated using the animal squares for Miss O’s name as her first and second names match the number of squares. That would leave the entire alphabet area for her birth details. For those of you unfamiliar with this pattern, here is a link to the designer’s website and also to a photograph of the design itself. Oh waily waily waily… I don’t know what to do. Continue on, or revise my decision to use this pattern as a birth announcement/sampler. But what would I stitch instead? Could I bring myself to stitch a prissy pink riot of clichés? I really don’t want to go down that track. If any of you have an alternative pattern idea, feel free to leave a comment with links to the design. In the meantime I will continue on with the animals until I have either found an alternative design or have convinced myself that the end product justifies the blurred vision. Oh, while I’m at it asking for suggestions, can anyone point me to a good source of alphabets and numbers that may fit in with the design, as I will need to sort out how I am going to fit all of Miss O’s names and dates into the available space should I keep going with this. Check back next month for an update and/or the start of the new project. A list of previous Noah’s Ark progress entries can be found here.